Light and fast again. Ready for seafest on Sunday. 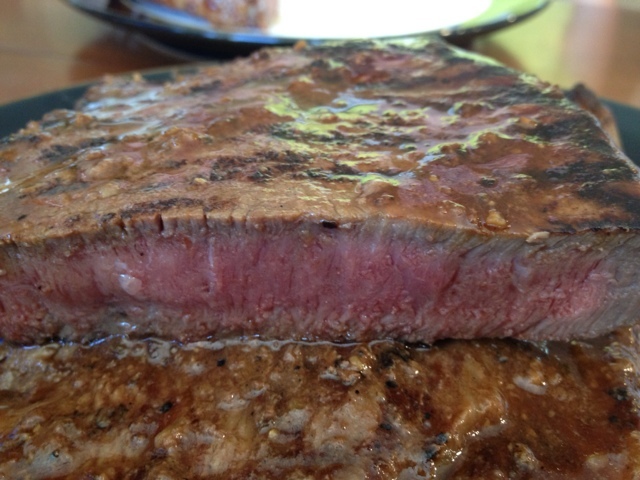 Had some sirloin nice steak yesterday. Down to 96.4kg. Have lost 6kg's in a month eating steak prettymuch every day. Take that! Felt better today. Kept it light and quick. Press felt strong today. 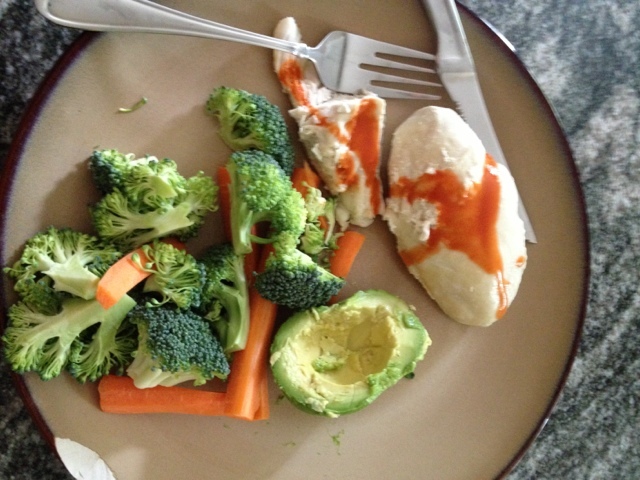 Still eating paleo-ish. Still at 98kg. Here is a steak from the other night. Enjoy! Tough one today. After work I went to my grandmothers funeral. Then after dinner I went to BLM to train and it was a rough workout to begin with. I started at 9:45pm and I have to get up early for a 16 hour shift tomorrow. On top of it all, my body feels beaten up, knees are screaming, shoulder, and hip are tweaky. It's really one I'd rather skip but just can't. I can see the light at the end of this session though. Was very tired today after work even after downing an Americano. Numbers were down a little bit but I got through it. I had some recovery baths with Epsom salts the last few nights. 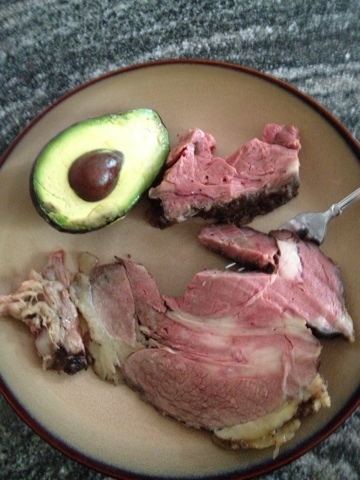 Here is a dinner from last night. 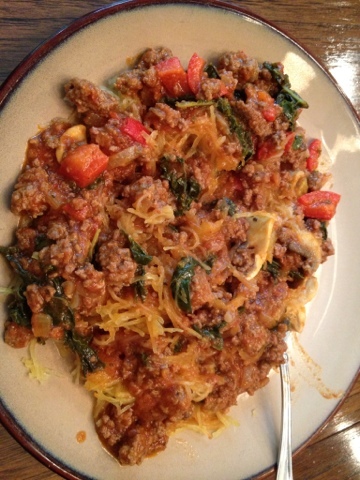 Spaghetti squash with ground beef. In the sauce there was mushrooms, kale, and peppers. I loaded an extra 20kgs on the bar during pulls today by accident. I was wondering why it felt so heavy. Haha. Guess a bit of strength is coming on. Technique is feeling good, especially on the split jerks. Did not have the best sleep last night unfortunately. That might have a bit to do with the slight dip in power. 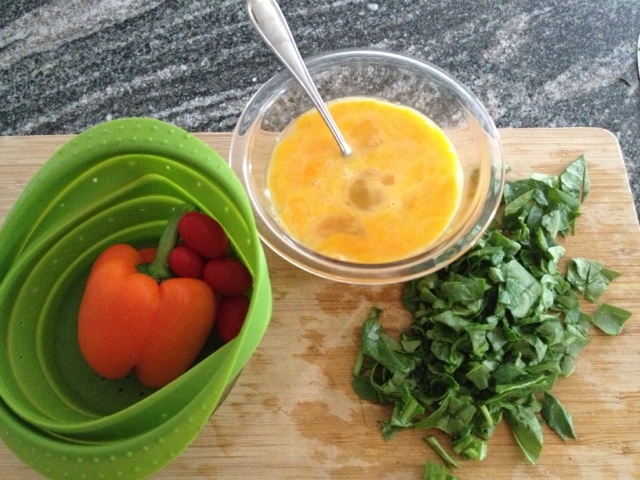 Had a great omelet with spinach, tomatoes, and peppers cooked in coconut oil. Had a good day ripping barbells today. Judas and his protege came to BLM for a session. I felt pretty good and got some solid work in. In other news I picked up a new cook book. 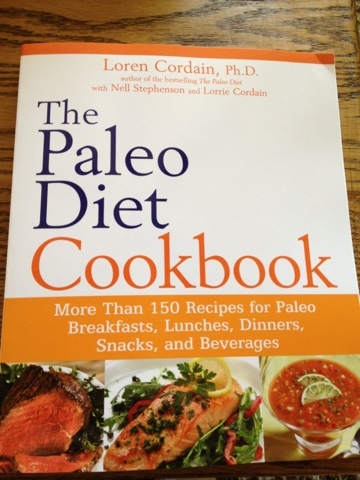 Hopefully eating more paleo geared will get me to a lean 94kg. Today I went to a nutritional seminar by Vincent Ziccarelli. I learnt a couple new things today. Canned tuna does not have the mercury levels that raw or frozen tuna does due to the tuna being a much smaller fish being used. Also, a very active athlete needs approximately 40 cal for every KG of bodyweight and up to 1.7g of protein per KG. Legs are real sore and tight from a tough squat workout the other day. I went for a walk before training with my wife and son and I find it helped warm me up a bit better. As I got into it I felt pretty slick. Good training overall. Today I trained with Jordan at BLM Barbell. Jordan is a national level lifter transplanted from Manitoba who joined up with Kilophile. It's good to train with a high level athlete to push yourself more and have someone with specific knowledge around. I was able to start to push a bit more this week so I am happy about getting back into shape. 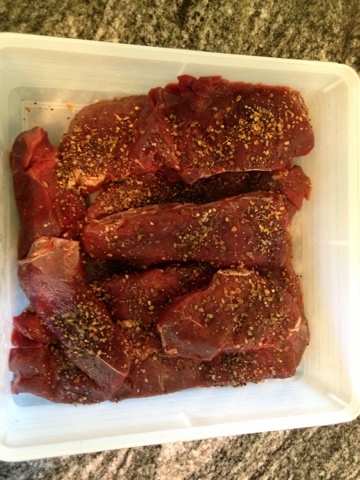 I cooked some rare deer steaks tonight again! Doing some power clean and split jerks really tired me out. I did double 140kg though. I am still not in my best shape but hopefully in the next week I start to climb out of the hole. 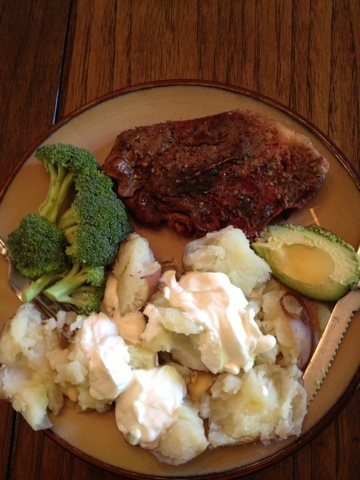 Last nights dinner was deer steak with broccoli and potatoes. I used Greek yogurt instead of sour cream on top! 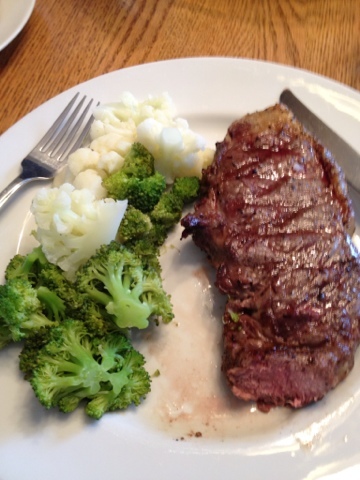 Steak was cooked rare with Montréal steak spice. Starting to get back some strength and conditioning now so I can push a bit harder. Technique felt good. I trained at the work gym on their new Pendlay set. For dinner I had an enormous amount of sushi, included in that was approximately 75 pieces of tuna and salmon sashimi. Yesterday's session was kept light. Couldn't seem to handle anything near limit weights for me. Today it took a while to warm up but once I was in the groove things went pretty well. I had something new happen today. When resetting the bar on my shoulders from a behind neck jerk, the bar slipped back off my shoulder blades and chicken winged me. I had thought I injured something for sure but was fine. Haha. 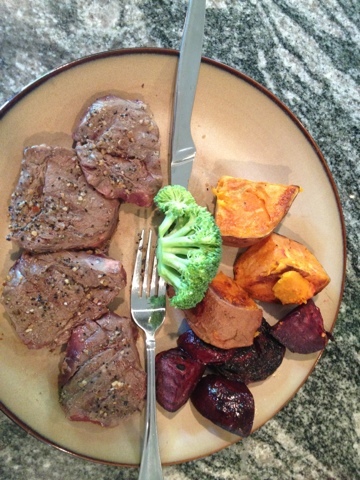 Dinner was rare deer steak with veggies. Not much sleep because of a teething baby the last few nights. 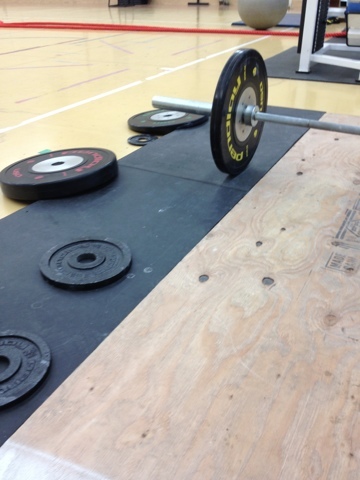 Still got to move a loaded barbell though, am I right. Kept it at controllable weights and surprisingly felt pretty fast. 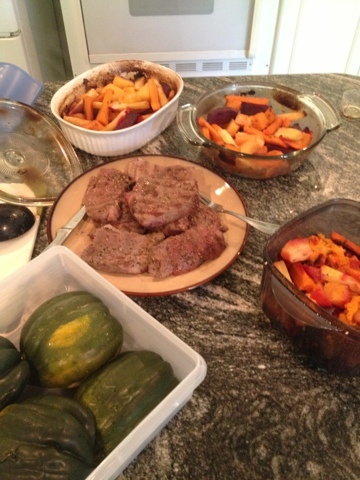 Still gnawing on deer steak and veggies for dinner. I made extra for work meals too. This isn't one meal, haha. Bodywieght down to 98kg.